A large strong steel vise that has a leg that sits on the floor to absorb the shock of any hammering. A hammer with a hemispherical head opposite the face. A hammer with a sharp head opposite the face and parallel to the handle. A hammer with a sharp head opposite the face and at right angles to the handle. A large heavy two handed hammer with two faces. 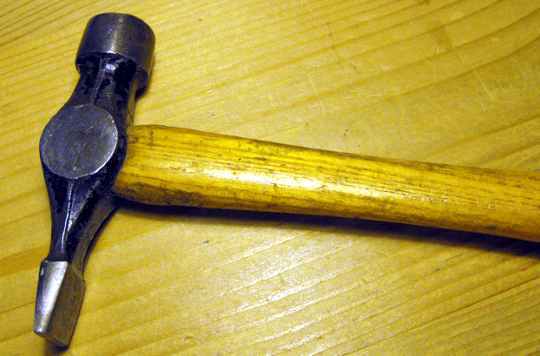 A small cross peen hammer used by woodworkers for driving small pins or nails. The vise at the right is typical of the ones used in blacksmith's shops. They are built very heavy and of course their main feature is the leg that sits on the floor. This leg takes the shock of any hammering work that has to be done. At the same time it is bolted to the top of the bench by heavy bolts. A lot of blacksmith's tools are very specific to the trade, but some of them are in wide use throughout the building industry. The hammers at A is known as a Ball Peen Hammer and it is used by many trades. B is known as a Straight Peen Hammer and is used mainly by metal workers. C is a Cross Peen Hammer that is in general use mostly in lighter weight sizes. D is a larger cross Peen used by metalworkers. 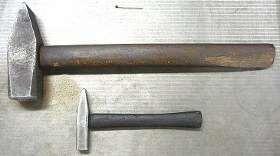 Above are a couple of Cross Peen Hammers that could be seen in any metalworking shop. 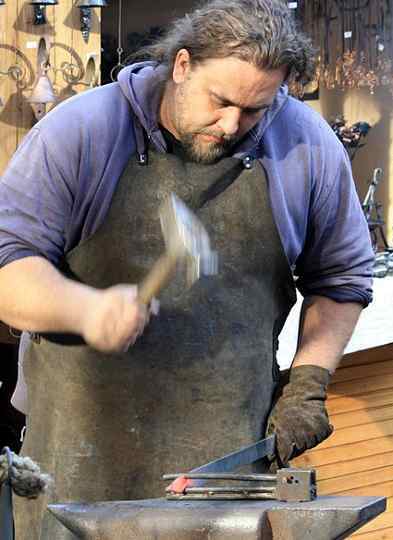 As with all hammers there is not only variety in the shape, for different uses, but also in the size and weight. The smith above needs a hammer that is just right to do the job before the metal cools. Anything smaller would take too long and anything larger would have less control. 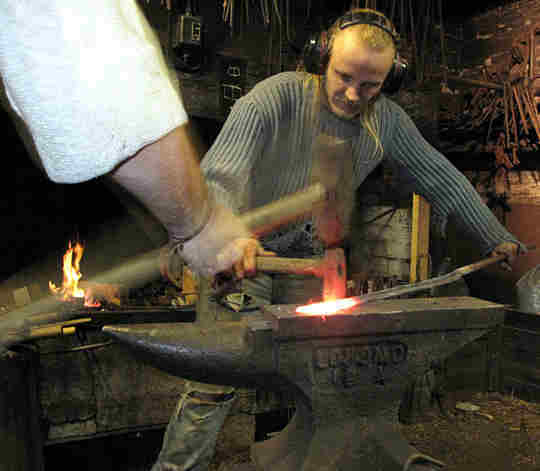 A typical activity in a smithy. The smith holds and turns the material as required while with the smaller single faced striker hammer he belts the hot metal where he wants the main blow to strike. His assistant strikes the same spot with a heavy two handed Sledge Hammer. This action of light blows followed by heavy ones is a repeated procedure until the work is placed in the forge again. For more on a ball peen hammer.